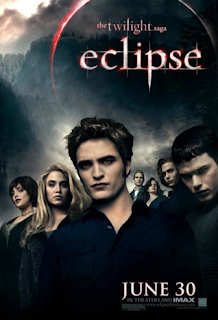 The newest Eclipse poster features everyones favorite vampire family, the Cullens. Edward (Robert Pattinson) looks yummy like usual, but Emmett (Kellan Lutz) should not be rocking that odd bowl cut. Carlisle (Peter Facinelli) needs to stop hiding in the back - he's too delicious to keep hidden!